What a difference two weeks makes for Oregon’s Jasmine Todd. Exactly a fortnight ago at the NCAA Championships, the sophomore was just 24 hours removed from a surprising failure to make the 100 meter final – despite entering the meet as the all-conditions collegiate leader in 2015. Flash forward to Friday night, back on the same track at historic Hayward Field: she’s now a member of Team USA for the IAAF World Championships. 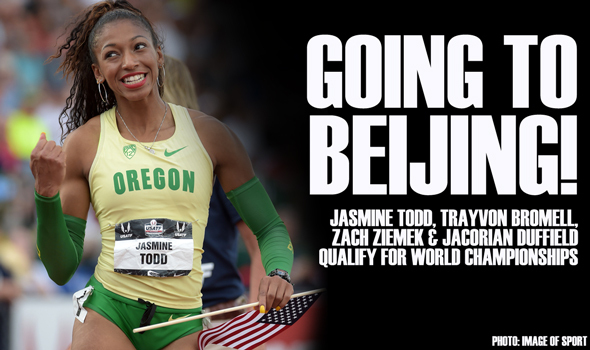 The Duck powered to a 10.92 to finish third – remember, just the top three earn the honor of wearing the red, white and blue in Beijing this August 22-30 – just behind American champion Tori Bowie in 10.81 and former Duck English Gardner in 10.86. She just barely held off Jeneba Tarmoh in 10.93 and Tianna Bartotella in 10.94. Todd’s time is tied for the fifth-fastest wind-legal performance all-time among collegians, inside or out of the collegiate season (ends at the NCAA Championships). That comes after running a windy 10.86 (+3.2m/s wind) for a share of the third-fastest time ever run by a collegian under all conditions. Current teammate and reigning NCAA 100-meter champion Jenna Prandini was sixth in 10.96. Prandini is one of those women with whom Todd is tied after running a 10.92 in the semifinal. Prandini will now turn her attention toward the 200 meters and long jump. Todd wasn’t the only collegiate sophomore to make Team USA at the 100 meter distance. Trayvon Bromell of Baylor made huge waves yesterday with a 9.84 performance that cemented him as the fastest wind-legal collegian ever and moved him to a share of No. 10 on the all-time world performers list. He didn’t quite match that form in the final, but was still outstanding with a runner-up finish in 9.96 (+0.0m/s wind) to take second behind Tyson Gay’s winning 9.87. He was sensational in the semifinal, running a windy 9.76 (+3.7m/s) for a share of the third-fastest time in collegiate history under all conditions. He remains on track for a potential rematch at the IAAF World Championships with Southern California’s Andre De Grasse, the breakthrough Canadian who usurped him for the NCAA title at this distance two weeks ago. Notably, Prandini and Southern Cal’s Beejay Lee finished sixth in their respective women’s and men’s finals to earn the opportunity to go to Beijing as alternates in the 4×100 relay pool. Lee finished in 10.08. Which other collegians booked their trips to Beijing on Friday? Go figure. A competition that spans two days and ten events came down to a desperate lurch to the finish in the event-finale 1500-meters, as Ziemek – a two-time Big Ten champ who redshirted 2015 – just did enough to earn the right to wear the red, white and blue. The Badger scored a career-best 8107 points overall to finish third and achieve the 8075-point standard required to compete in Beijing. He finished that 1500 in 4:58.93 as the last man across the line – but place doesn’t matter in the decathlon, only points. "Double-Z" racked up a lot of those in the pole vault, posting a 17-10½ (5.45m) clearance for the top score of 1051 in that event, and neared 1000 points in the 100 meters (10.57 for 959 points) and long jump (25-3½/7.71mw for 987). Former world champion Trey Hardee took the win at 8725 and Jeremy Taiwo was second at 8265. Reigning world champion Ashton Eaton will also compete in Beijing, having earned a bye as the reigning world champion. “JD Airlines” was flying higher than ever on Friday night, as the indoor and outdoor NCAA Champion soared over a career-best 7-8 (2.34m) on his second attempt to secure runner-up honors behind reigning Olympic silver medalist Erik Kynard at 7-9¼ (2.37m). Duffield was excellent in the six heights he cleared, missing only once at 7-8 and once earlier at 7-2½ (2.20m). Each of the three clearances in between were all first-attempt makes. That 7-8 make separated him from former IAAF World Champion Jesse Williams, who finished third at 7-7 (2.31m) to take the third spot on Team USA. Kynard tied Williams’ USATF Outdoor Championships record. Just missing the team was Texas A&M-Kingsville junior Jeron Robinson, the three-time defending NCAA Division II high jump champ. He finished fourth overall after clearing 7-5¾ (2.28m) on his first attempt but missing three-in-a-row at 7-7, which would have tied his all-time NCAA DII record set earlier this season. Like Oregon’s Sam Crouser in the men’s javelin the day before, the frosh Orji hasn’t yet clinched her berth to Beijing as a member of Team USA but she’s put herself in a very good position. The NCAA outdoor champion and U.S. Junior record holder finished third overall in the senior competition with a leap of 45-3¾ (13.81m) on her fourth attempt to edge out fourth-place Lynnika Pitts and fifth-place Amanda Smock by less than two inches total. However, Orji has yet to achieve the IAAF qualifying standard of 46-7¼ (14.20m). She’s come very close with a 46-5¼ (14.15m) leap to win the NCAA title and set the U.S. Junior record. She can get to China in one of two ways. First, she gets the standard before August 10. If she does that, she’s automatically in. Second, she doesn’t get the standard but is able to get in based on the 2015 descending order list. For the first time, the target field size of 32 will be filled in as necessary based on 2015 performances, by rank. She’s currently ranked No. 18 in the world, but there’s a lot of jumping left to be done around the world between now and August 10. Two weeks ago on the same runway at the NCAA Championships, Carson was moments away from winning the national title. Sitting in the lead with a third-round throw of 189-4 (57.72m), only penultimate thrower Irena Sediva of Virginia Tech – the regular season collegiate leader – stood between Carson and the top of the podium. The Hokie launched a heave of 192-9 (58.76m) to take the lead, and Carson couldn’t match with a 57.64m throw, leaving her one step from the top of the podium. No collegian was going to beat her on Friday, as the junior finished third overall with a heave of 195-5 (59.57m), again in round three. That mark is more than a meter better than that PR she set at the NCAA Championships. However, like Orji in the triple jump, Carson does not yet have the IAAF standard to compete in Beijing The asking distance is a steep one at 200-1 (61.00m) – only three collegiate women have ever thrown that far, in or out of the college season – and she currently sits at No. 31 on the 2015 world descending order list, right on the periphery of that target field size of 32. Like Orji, she will either meet the standard at some point this summer or await her at-large fate on the August 10 qualifying deadline.